Our development team has been working hard on new features for Yoast SEO Premium. You can expect some exceptionally cool stuff in the coming months. Besides fixing a couple of bugs, we lay the groundwork for one of these features today. Eagle-eyed users of the 3.7 version of Yoast SEO Premium will probably have noticed the new box beneath the analysis section, called ‘Insights’. In its current form, Insights shows you the words or word combinations that appear most often in your text. Yoast SEO scans your content and analyses it as part of the readability check. Its goal is to help you write better content. With this new feature, you could use the results to check if your text is optimized for the right keywords. Maybe you’ll get valuable insights when a different word keeps popping up or you could notice a new combination of words. 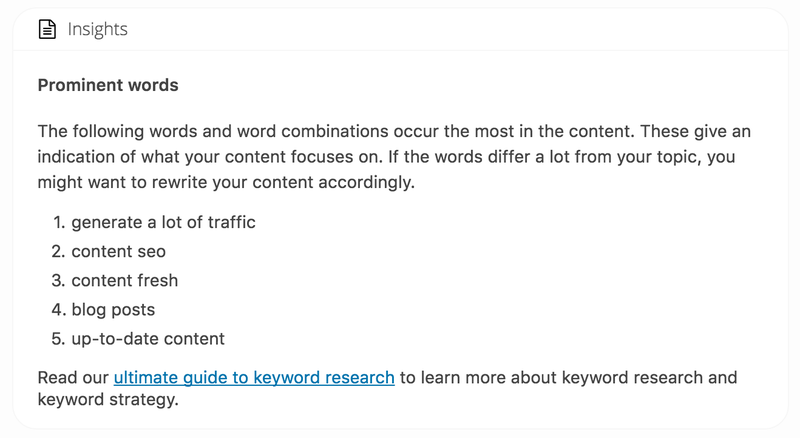 If the words in Insights don’t line up with your keyword research for this post, well, then you have work to do. Obviously, we’ll enhance this feature soon. In a little while, we can give you all kinds of cool suggestions for your texts or the structure of your site. And who knows what else. It’s one of a slew of features we have planned for Yoast SEO Premium. If you don’t have premium yet, we highly recommend you get it, since it adds a lot of value to the plugin. We can’t wait to show you what’s next! To coincide with this release, we’ve also published a new Keyword research training. Our SEO copywriting training is a great success, but we’ve noticed that quite a few people already know a lot about the writing part. However, they’d love to learn more about the keyword research part. That’s why we’ve made them available separately as well. You can now follow whatever course fits your goals best. New: Yoast Keyword research training!